In this study, three-layered Cross-Laminated Timber (CLT) manufactured from Acacia mangium wood panels were developed by using two different types of adhesives, namely, phenol resorcinol formaldehyde (PRF) and one-component polyurethane (PUR). The aim of this work is to investigate and compare the physical and mechanical properties of CLT manufactured using PRF and PUR adhesives. Water absorption (WA), thickness swelling (TS), and delamination of both types of samples were investigated as their physical properties. PRF-bonded CLT showed better physical properties than PUR-bonded CLT. 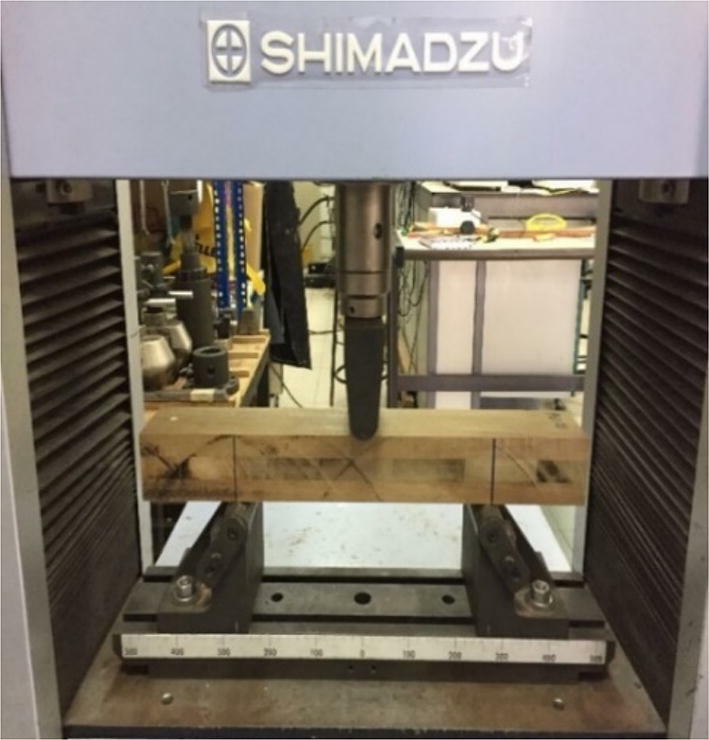 In terms of mechanical properties, bending test, shear modulus, and compression parallel to grain were studied. The results revealed that global modulus of elasticity (Em,g) and modulus of rupture (MOR) of panels bonded with PRF adhesive were higher than three-layered panels made from PUR adhesive. Meanwhile, shear modulus (G) of PRF-bonded CLT was 116.50 N/mm2, 20% higher than that of the PUR-bonded CLT which recorded a shear modulus value of 92.48 N/mm2. As for compressive properties, the MOE in compression (Ec,0) and compression strength (fc,0) of the PRF-bonded CLT (5304 N/mm2 and 28.99 N/mm2, respectively) was slightly higher compared to that of the PUR-bonded (4787 N/mm2 and 28.14 N/mm2, respectively). 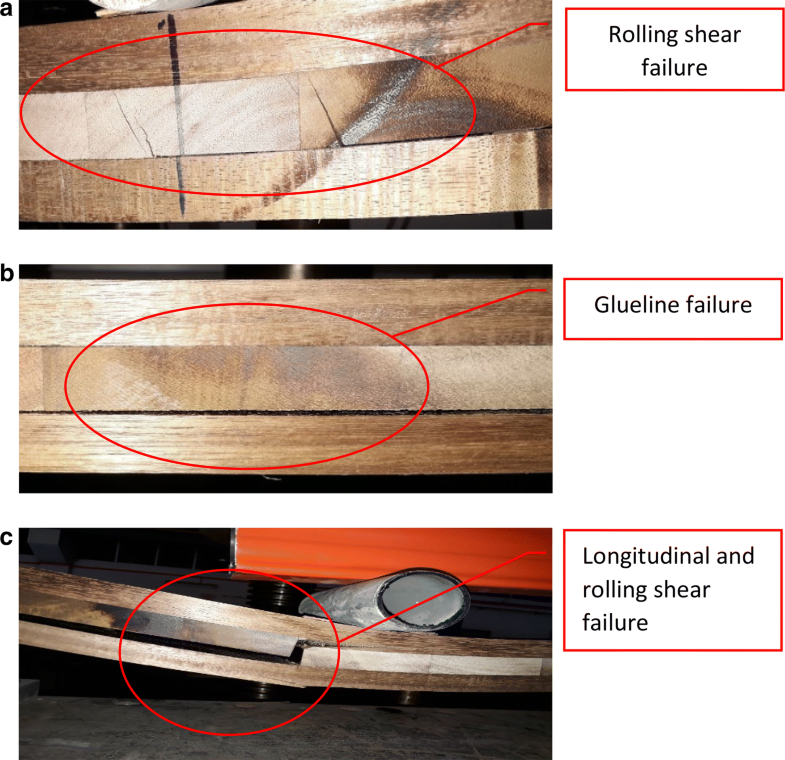 Three main types of bending failure modes were observed in the CLT samples, namely, rolling shear, glue-line failure, and tension. The failure modes of shear were observed by two ways, which is delamination and rolling shear. Lastly, shearing, splitting, and crushing were recorded in compression failure modes. Cross-Laminated Timber (CLT) is an engineered wood that was developed in Austria in the 1970s and 1980s . After 30 years of intensive research and development, CLT are gaining popularity as construction materials in residential and non-residential applications particularly in Europe. Recently, CLT has become a product of interest that is being used in international production outside of Europe . A typical CLT is a rectangular-shaped product made from at least three orthogonally bonded lamellae of lumbers which are bonded on top of one another in perpendicular direction using a structural adhesive . The resulting alternating grain (parallel and perpendicular to each other) directions give CLT strength and stiffness in two directions, making it suitable for primary structural material in multi-storey construction such as two-way spanning slabs, walls, and diaphragm . Usually, CLT panels are produced with 3, 5, 7, or more layers with a maximum thickness of approximately 500 mm, length of ≥ 16–20 m, and width of ≥ 3 m.
In Asian countries, except Japan and China, development of CLT is just getting started. In Malaysia, CLT is still in its beginning phase, therefore, a lot of development works is needed to facilitate CLT production using domestic wood. Extensive research and works comprising raw materials screening, manufacturing process, testing, manual development, standard, and certification as well as design and prototyping are necessary. Selection of suitable raw material, which is the prerequisite and foundation for quality CLT production, is therefore of utmost importance. When fabricating CLT from domestic wood species, it is necessary to take into account more than just the availability of the species. It is also important to consider the strength properties, anatomical structure, bonding properties, and durability of that particular species. Typically, temperate softwood lumber is used to manufacture CLT, with an exception of a study by Hamdan et al. who used Sesenduk (Endospermum spp.) in CLT. Very scarce or little information can be found for CLT made from other tropical hardwoods. Hardwood normally have strength comparable or greater than that of softwood of the same density thus can be good raw material for CLT production. Based on the density and mechanical properties of Acacia mangium wood, it appears that this species would be suitable for manufacture of engineered structural timber. It is considered as one of the major wood species in the Malaysia forest plantation, A. mangium offers great potential as raw material for CLT manufacture. Based on raw material results of bonding properties in the previous study, it is anticipated that CLT from A. mangium would give superior strength values. The aim of this paper is to evaluate the performance of CLT made from A. mangium wood bonded with two types of adhesives, namely, phenol resorcinol formaldehyde (PRF) and polyurethane (PUR). Twenty-year-old A. mangium wood with density of 673 kg/m3 and moisture content of 12 ± 3% was obtained from a local processing mill located at Bukit Rambai, Melaka, Malaysia. The wood was sawn, trimmed, and planed into 1000 mm long by 70 mm wide and 18.2–mm-thick lumber. All lumbers were S4S (sanding four surfaces) planning to get smooth surface, reduce oxidation to improve the gluing effectiveness, and ensure the dimensional uniformity. Selection of lumber is based on some criteria shown in Table 1. Lumbers free from defects and good appearance were classified as group A. On the other hand, group B and group C are the lumbers that contain, respectively, small and large number of defects such as knots, ripple marks, fuzzy grain. Two types of adhesives were used in this study, i.e., phenol resorcinol formaldehyde (PRF 1734, AkzoNobel) and one-component polyurethane (PUR, Jowapur 687.22). Hardener 2734 (commercial code) was also used in the preparation of PRF at a ratio of 100 to 25 parts by weight of PRF to hardener. 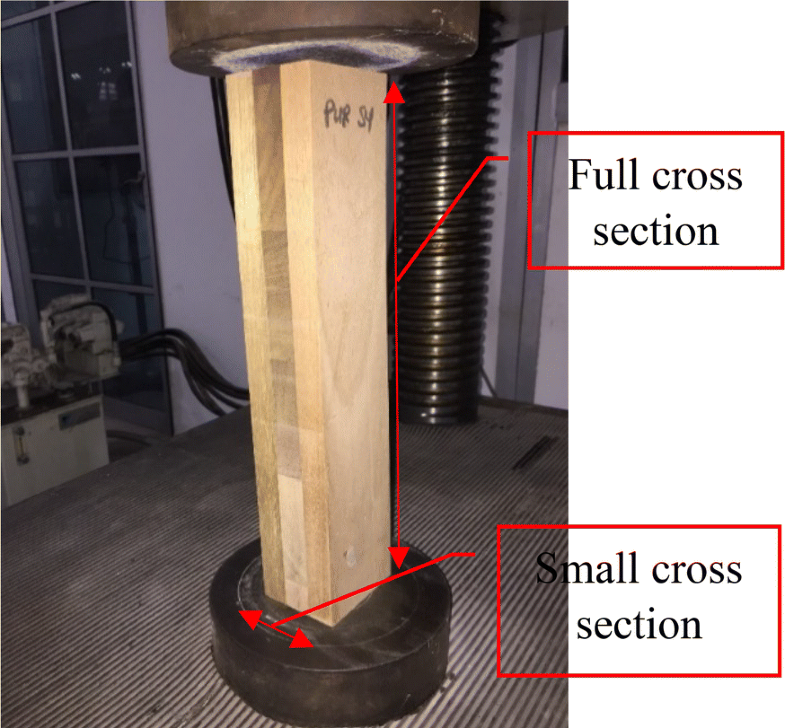 In this study, 20 three-layered CLT of 1000 mm × 280 mm × 54.5 mm in size was produced by gluing three pieces of lumbers parallel and perpendicular to each other with edge bonding with 90° alternating transverse CLT layers. Prior to lamination, the A. mangium lumbers were segregated into two groups, A and B, based on the quality of lumber. The criteria for the grouping are shown in Table 1. The A-group lumber was used for face and back layer, while group B for core. Boards were glued using two types of adhesive PRF and one-component PUR. The adhesive spread rate was set at 250 g/m2 for both adhesives. Using a compressive machine, the assemblies were subjected to pressing the boards into panels with pressures of 1.5 N/mm2, and retained under pressure at 30 °C for 1 h and 30 min. Ten PRF-bonded CLT samples and ten PUR-bonded CLT samples were produced. Then the laminated panels were conditioned at 65 ± 5% RH and 20 ± 2 °C for 2 weeks prior to cutting into specimens for mechanical and physical testing. The three-layered Acacia CLT with dimension of 90 mm × 90 mm × 54.5 mm were subjected to delamination test according to BS EN 391:2002 for Glued Laminated Timber (delamination test of glue lines) method ‘B’ . Three specimens were tested for each adhesive type with a total of 24 specimens. The specimens were placed in a pressure vessel and submerged in water at ambient temperature. Then a vacuum of 60 kPa was drawn and held for 30 min. Subsequently, the vacuum was released and pressure of 550 kPa was applied and retained for 2 h. Once the vacuuming has completed, the test pieces were dried for a period of approximately 24 h in a circulating oven at 70 ± 5 °C. Delamination was observed and recorded when the mass of the test pieces has returned to be within 100% to 110% of the original mass. After removal from the oven, the specimens were examined for the occurrence of delamination or open glue lines. The length of the open glue lines was determined by first inserting a thin metal probe between the two delaminated surfaces. Measurements were only counted if the depth of the delamination is less than 2.5 mm and more than 5 mm. Two attributes were determined: (i) Total delamination (Delamtot) and (ii) maximum delamination (Delammax) of a test pieces were recorded. The percent delamination was calculated using Eqs. 1 and 2.
where ltot,delam is the total delamination length, in mm; ltot,glueline is the sum of the perimeter of all glue lines in a delamination specimen, in mm; lmax,delam is the maximum delamination length, in mm; lglueline is the perimeter of one glue line in a delamination specimen, in mm. where W1 = the mass (in g) of test sample before immersion (the original dry weight); W2 = the mass (in g) of test sample after immersion; Tf = the thickness, in mm, of test sample after immersion; Ti = the thickness, in mm, of test sample before immersion (the original dry weight). where F = load at a given point on the load deflection curve, in N; L = support span, in mm; b = width of test specimens, in mm; d = depth of test specimens, in mm. where F2 − F1 = is an increment of loads on the straight-line portion of the load deformation curve, in N; W2 − W1 = is the increment of deformation corresponding to F2 − F1, in mm; a = distance between the loading position and the nearest support in a bending test, in mm; G = is the shear modulus and the shear modulus G shall be taken as infinite; l = span in bending, or length of test piece between the testing machine grips; b = width of test specimens, in mm; h = depth of test specimens, in mm. Bending tests were conducted according to the European standard BS EN 408  which is certified for determining the stiffness and strength properties of CLT based on the prEN 16351 standard . The load was applied at a constant rate and the rate of movement of the loading head is not greater than 0.0002 h mm/s. 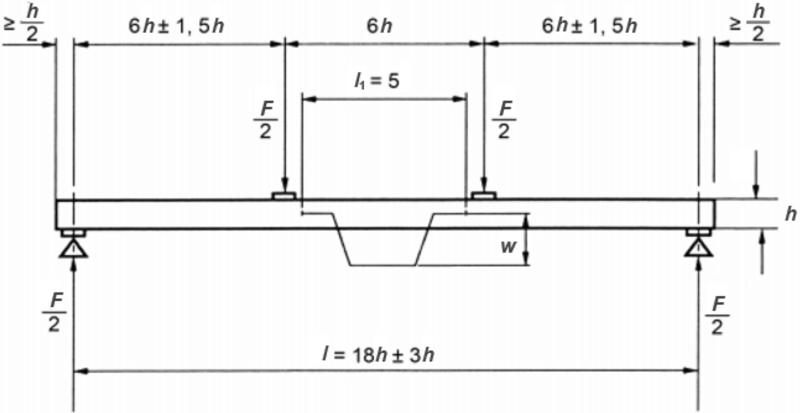 Flexural test measures the force that is required to bending a beam under 3-point loading conditions. The test pieces were symmetrically loaded bending at center points over a span of 5 times the depth (Fig. 2). The size of 3-point bending was 470 mm × 70.5 mm × 54.5 mm in length, width, and thickness. The apparent modulus elasticity (Em,app) was calculated based on Eq. 7.
where F2 − F1 = is an increment of loads on the straight-line portion of the load deformation curve, in N; W2 − W1 = is the increment of deformation corresponding to F2 − F1, in mm; l1 = gage length for the determination of modulus of elasticity, in mm; I = second moment of area, in mm. The shear modulus (G) was then calculated from Eq. 8.
where Fmax = maximum load, in N; A = cross-sectional area, in mm2. where F2 − F1 = is an increment of loads on the straight-line portion of the load deformation curve, in N; W2 − W1 = is the increment of deformation corresponding to F2 − F1, in mm; l1= gage length for the determination of modulus of elasticity, in mm; A = cross-sectional area, in mm2. Table 2 displays the effects of different types of adhesives used on both the physical and mechanical properties of the CLT panels. All the examined properties were found to be significantly (p ≤ 0.01) affected by the different types of adhesives used, with exception for modulus of rupture (MOR) and compression strength (fc,0). These effects were further analyzed by the least significant difference (LSD) method and the results are given in Tables 3 and 4. The TS, WA, and delamination properties of both PRF- and PUR-bonded A. mangium CLT samples are shown in Table 3. From the table, it can be seen a similar trend was observed for both TS and WA in CLT made from PRF and PUR adhesives. On the other hand, CLT made from PUR is less resistant to water as indicated by its higher WA and TS compared to CLT made from PRF. The percentage of delamination also showed the same trend as TS and WA where PRF showed the lowest percentage of delamination compared with PUR adhesive. The panels made from PUR adhesive swelled 1.1% and absorbed 7.8% water after 24 h of soaking in cold water. Meanwhile, panels bonded with PRF adhesive are much more stable with TS of < 0.7% and WA of about 7%. Clearly, PRF is much more resistant in water than PUR. Konnerth et al. pointed out that, dissimilar to PUR, PRF is able to penetrate into wood cell wall and therefore ensures higher and stronger covalent bond between wood substance and polymer. As a result, higher extent of resistance against water infiltration could be attained by limiting the access of water to the bonding sites. Therefore, lesser stress was imposed to the bond when it was exposed to water-induced shrinking and swelling, resulting in lesser adhesion displacement . Moreover, between the physical properties of PRF and PUR panels, the former performed significantly superior, which can also be attributed to the better gap-filling properties of PRF. This was proven by the lower delamination of PRF-bonded panel (Fig. 4) as compared with PUR-bonded panel even after being subjected to vacuum pressure. 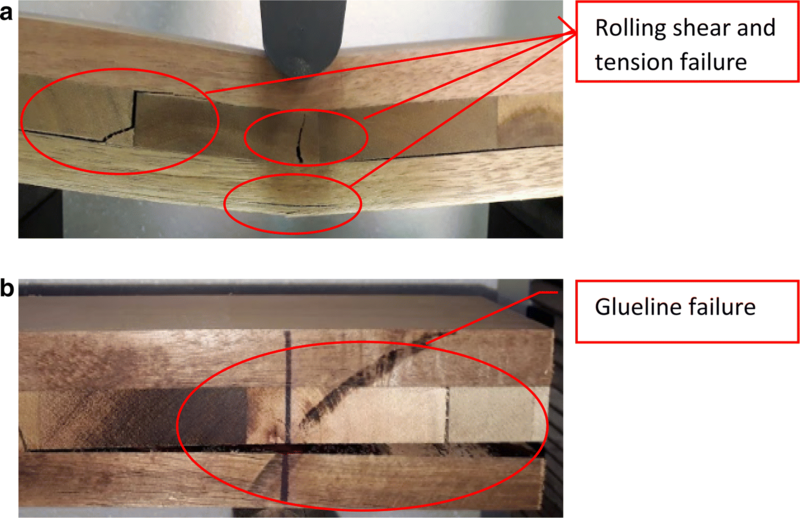 Similar result was reported by Castro and Paganini  where PRF-bonded poplar- and Eucalyptus grandis-laminated boards had the lowest percentage of delamination as compared to other adhesives used in their study. In this study, the extent of delamination of A. mangium CLT met the first requirement (no. (i)) of prEN16351 that specifies Delamtot≤ 10% and Delammax≤ 40% for both adhesives PRF and PUR- bonded panels. However, PRF provided better water resistance compared to PUR. The curing or hardening of PUR commences when the isocyanate groups react with the water in the air or in the wood. As a result, carbon dioxide was released . Slight foaming of PUR during hardening due to the release of the carbon dioxide could led to the formation of voids or air pockets in the glue line, creating some weak points along the joint. Therefore, delamination in PUR-bonded CLT is pronged to occur when it is being exposed to hot and wet conditions. Furthermore, A. mangium is a relatively hard wood with an average density of 675 kg/m3 and tangential and average radial shrinkages of 6.4% and 2.7%, respectively . Hence, delamination is much easier to occur in particular on the tangential side. The fact that A. mangium fulfilled the no. (i) requirement indicates that good bonding has been achieved using both PRF and PUR adhesives. This result also confirmed that the pressure and adhesive spread rate used in fabricating A. mangium CLT are sufficient. Table 4 summarizes the mechanical properties of A. mangium CLT. 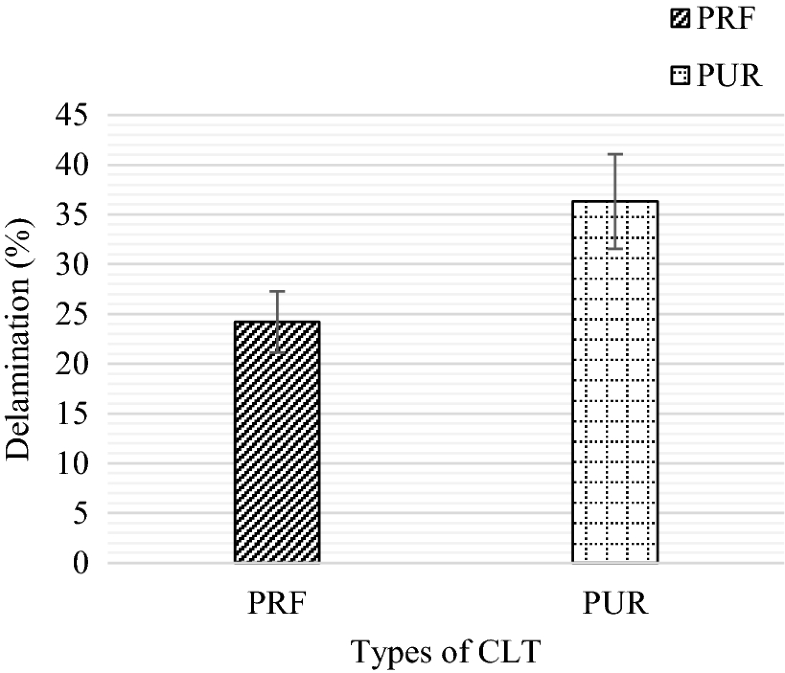 From the results, it can be observed that PRF appears to be a much superior adhesive than PUR. According to Toong et al. , factor that influences the wood quality in CLT is density because it correlates with both the mechanical strength and shrinkage properties of timber. However, PRF-bonded CLT has higher mechanical strength than the PUR-bonded CLT, even though the density of both CLT panels was similar. Table 4 summarizes the mechanical properties of the tested CLT specimens bonded with both PRF and PUR adhesives. As demonstrated in Table 4, the average global MOE (Em,g) of the PRF-bonded CLT was 12,639 N/mm2 which is 8% higher than the PUR-bonded CLT (10,740 N/mm2). Meanwhile, the average MOR values for PRF- and PUR-bonded CLT were 36.55 N/mm2 and 27.78 N/mm2, respectively. The MOR of PRF-bonded CLT was 14% higher than PUR. The MOE and MOR of the single lamellae of A. mangium in this study was around 8000 N/mm2 and 25 N/mm2, respectively. Therefore, the validity of the CLT produced in this study was proved. Beech CLT made by Franke  reported a relatively close value of global MOE and bending strength compared to the A. mangium CLT fabricated in this study. The global MOE of the beech CLT was 12,306 N/mm2 while the bending strength was 43.8 N/mm2. Buck et al. produced MUF-bonded European Norway Spruce (Picea abies) CLT panels consisting of alternating 90° transverse layers and revealed that the global MOE and MOR of the CLT panels ranged from 7601 to 8971 N/mm2 and 29.1 to 38.4 N/mm2, respectively. Similar results were also obtained for other studies using different types of wood (Endospermum malaccense, P. abies, Populus tremuloides, and other softwoods), adhesive, thickness, and density [13, 17]. Based on literature results, the A. mangium CLT in this study exhibited higher global MOE but lower bending strength. As demonstrated in Table 4, the average apparent MOE (Em,app) value of PRF-bonded CLT was 2023 N/mm2 compared to 1629 N/mm2 for PUR-bonded CLT. The latter gives lower values by 11%. The obtained apparent MOE was very similar to the values reported by Mustamin and Suryoatmono  who fabricated three-layered CLT using Kapur (Dryobalanops aromatica). Meanwhile, shear modulus (G) of PRF-bonded CLT was 116.50 N/mm2, 20% higher than of the PUR-bonded CLT which recorded a shear modulus value of 92.48 N/mm2. Table 4 summarizes the compression properties of the PRF- and PUR-bonded CLT samples. The average values for MOE in compression (Ec,0) of the PRF-bonded CLT was 5304 N/mm2 which is 5% higher than the PUR-bonded CLT which recorded a value of 4787 N/mm2. Meanwhile, the average compression strength (fc,0) for PRF-bonded CLT was 28.99 N/mm2 which is slightly higher (1.5%) than those of PUR-bonded CLT with 28.14 N/mm2. The average MOE in compression values and the compression strength displays that the strength and stiffness of PRF-bonded CLT were slightly higher than PUR-bonded CLT. Comparable results were reported by He et al. who fabricated PUR-bonded CLT with Canadian hemlock and recorded the compressive strength and MOE in compression values of 18.3 N/mm2 and 6851.4 N/mm2, respectively. 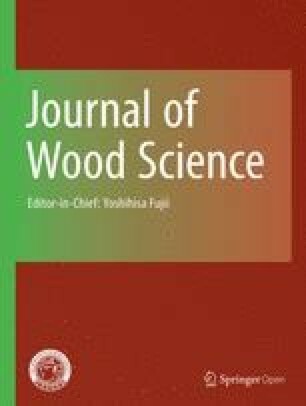 In comparison to CLT fabricated with Canadian hemlock, CLT fabricated using A. mangium in this study has higher compressive strength but lower MOE in compression. Generally, it can be observed that the mechanical properties were more superior in PRF-bonded CLT compared to that of the PUR-bonded CLT. Different performance levels displayed by these two adhesives are mainly because they are from different adhesive groups, where PRF is in situ polymerized adhesive, PUR is pre-polymerised adhesive . PRF, as one of the members from in situ polymerized adhesive, possesses higher and more rigid crosslinked polymers. Meanwhile, PUR is a type of flexible polymers. Therefore, these two types of adhesives have very different ability to distribute moisture-induced stress in an adhesive bond and therefore also have dissimilar mode of failure . Another probable reason for such phenomenon is PRF adhesive were found to be able to penetrate into the wood call well while PUR resin did not, as investigated by Konnerth et al. using scanning thermal microscopy (SThM). Degree of penetration is one of the major factors that affect the adhesive bond performance. Higher penetration enhances the covalent bonding by increasing the surface contact between adhesive and wood substance. In addition, greater distribution of stress could be attained when placed under load and subsequently leading to better mechanical properties . Failure types are different among the CLT samples in the four-point bending tests. In 20 tested samples for both types of adhesive-bonded panels, three types of failure modes were observed. The most prominent failures can be categorized into the following three modes. Firstly, failure due to rolling shear, which occurred when there was shear stress transverse to the grain and this type of failure appeared more in PRF-bonded CLT as shown in Fig. 5a. Secondly, glue line failure occurred when there was failure in the bonding, as shown in Fig. 5b, with both types of CLT being affected especially those of PUR-bonded CLT. Thirdly, bending failure was due to the tension of the lowest outer layer, as shown in Fig. 5c, with only PRF-bonded CLT being affected. The failure split and fractured the adjacent glue line. These findings are in agreement with Sousa et al. , where the samples have common failure in the lower fibers tension and delamination problems in the contact surface between lamellae. It is also supported by Mohamad et al. who reported that the failure started in timber and tension zone, the cracks proceeded to the weaker zone and showed the failure of wood rather than glue line. The failed surfaces were seen to have occurred more in the glue line than in woods, suggesting that the manufacturing process adopted in this study is acceptable. 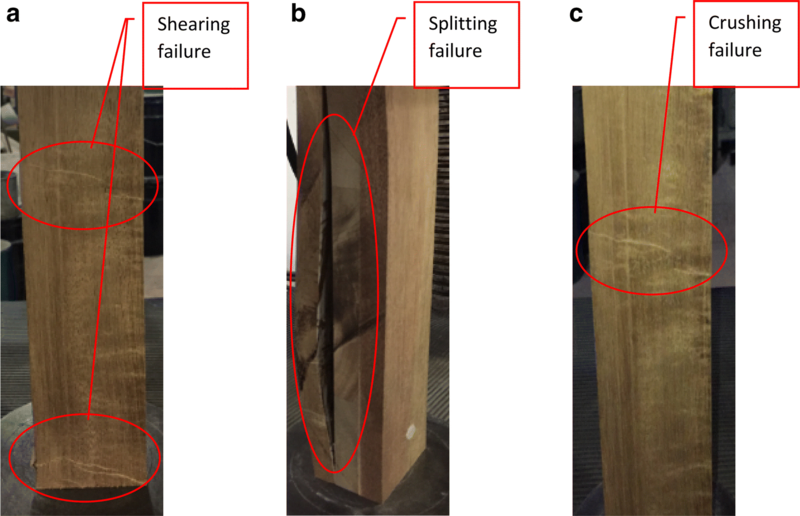 Failure modes for shear were not much different among the two types of CLT produced. In shear, the most prominent failures can be categorized in the following two modes. Firstly, failure due to rolling shear and tension, which occurred when there was shear stress transverse to the grain and appeared in both types of CLT, and simple tension at the bottom layer of lumber due to defect (around knot), as shown in Fig. 6a, with both types of CLT being affected. Besides, brittle or brash tension in the middle layer where a clean break occurred and extended entirely through it. Second failure mode is glue line failure, which occurred when there is failure in the bonding, as shown in Fig. 6b, with both types of CLT being affected, especially PUR-bonded CLT. Normally, the rolling shear occurred due to the wood anatomical features such as in the radial tangential plane in wood in comparison to the longitudinal radial or longitudinal tangential and simple tension also occurred due to the presence of knot . Failure modes were consistent for both types of CLT. The three most common failure modes are shown in Fig. 7. The failure caused by shearing is presented in Fig. 7a which is maximum shear plane along 45°. Splitting failure is depicted in Fig. 7b due to the low bonding integrity between wood and adhesive. Crushing failure is illustrated in Fig. 7c due to the weakness in compression and failure along maximum compression line. Similar results were reported by Buck et al. for CLT panels made from P. abies. According to Puaad and Ahmad , crushing, shearing, and wedge-splitting failure are caused by the internal defect. They also noted that failures in the form of splitting, crushing, splitting, and brooming indicate that the timber possesses internal defect. Both crushing and shearing failure may be influenced by the internal defects which may have naturally existed in the specimen prior to testing. Three-layered PRF- and PUR-bonded A. mangium CLT has been successfully manufactured in this study and the results revealed that the mechanical properties of the CLT panels were more or less the same with literature studies. CLT panels bonded with PUR adhesive swelled and absorbed more water after being soaked in cold water compared to the panels bonded with PRF adhesive. The same observation goes for delamination test. The mechanical properties of PRF-bonded CLT is more superior than the PUR-bonded CLT with higher values in four-point bending, shear modulus, and compression parallel to the grain, respectively. Three main types of bending failure modes could be observed in A. mangium CLT, namely, rolling shear, glue line failure, and tension. For shear failure, there were two main types of failure modes observed, namely, delamination and rolling shear. Lastly, three main types of failure mode were observed in compression failure modes, which are shearing, splitting, and crushing. Based on these findings, it is therefore concluded that the three-layered CLT manufactured from A. mangium wood, comprising the ratio of 100:20 PRF adhesive and hardener, 250 g/m2 spread rate, and 1.5 N/mm2 pressing pressure are capable to manufacture CLT panels with good mechanical, physical, and thermal properties. CLT (PRF) will extend the area of opportunity for industries to replace wood and fabricate different products due to the significant performance which can be attributed to better gap-filling properties of PRF. Even though PUR-bonded CLT exhibited inferior properties, it still can be used for lesser strength applications where the transparent color of the glue lines is needed. Although the results showed a satisfactory result, some development works and further research are still needed. It is anticipated that through extensive researches and promotions, CLT is able to serve as a supplement to the wood-based industries so the locally underutilized species can be utilized sustainably to improve wood utilization efficiency that will benefitting natural forest conservation. NMY and RMSJ conducted the experiment of the study and were responsible for data collection and analysis. PMT was the supervisor in monitoring the study. SHL and MAK were the main contributors in writing the manuscript. All authors read and approved the final manuscript. The authors wish to thank the HLM wood product for the assistance provided in the fabrication of CLT samples. The authors also wish to express gratitude to Universiti Sains Malaysia and Faculty of Engineering, Universiti Putra Malaysia for providing the mechanical testing facilities. This study was financially supported by the Higher Institution Centre of Excellence (HiCoE), Project No. 6369109.